After my Macao trip last week, I had to go back to my home town in Sibu, Sarawak, for a couple of days to handle some family business and settle some chores. 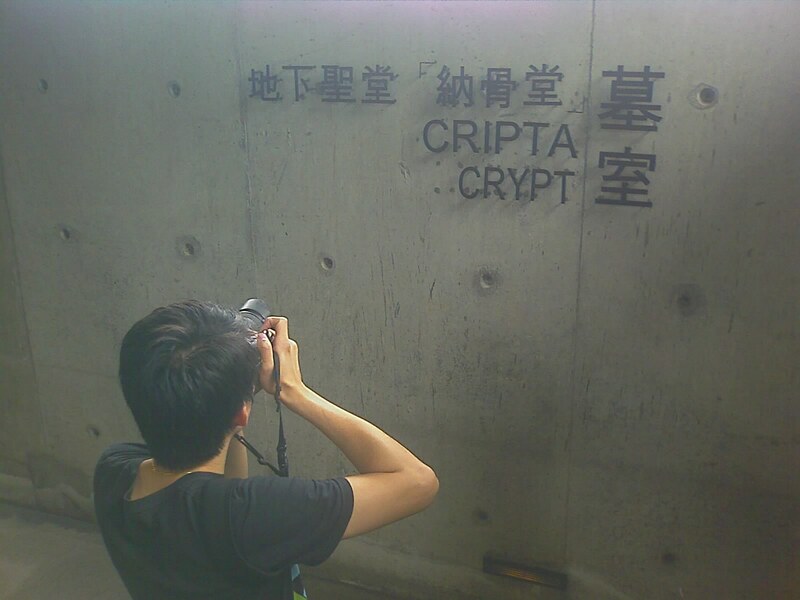 It was good to be back after more than four years. 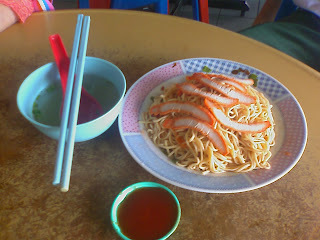 I do miss the food there. So, obviously I had to eat all my favourites - Sarawak Laksa, Kampua noodles, fried noodles, Ting Pian Woo broth, biscuits, kompia, etc. 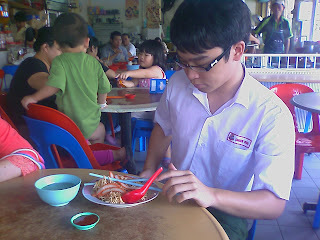 My nephew, Darren, after school taking a plate of kampua noodle. 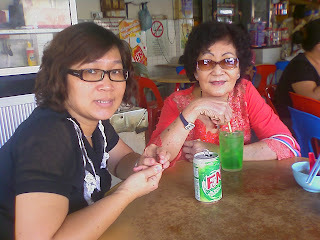 My third youngest sister together with my mom, took me for kampua noodles. My plate of kampua noodles. I am a poor food blogger! Always eat the food, then only remember to take photos for the blog. Gotta do better next time... LOL. 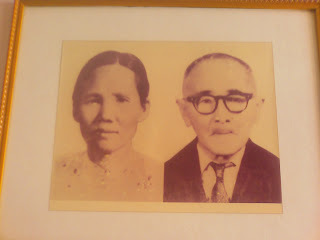 A photo of my grand parents from my father's side. Seeing a photo of my grand parents in the house made me recall some vague memories of peppercorns, rubbers, durians, rambutans and basketball. I did not know why those memories came to me, but I could almost smell the raw rubber and dried peppercorns. 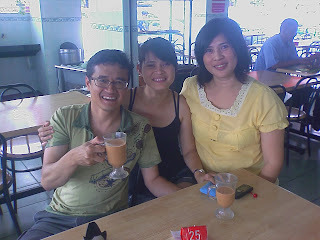 My family moved to Miri when I was 4 years old. 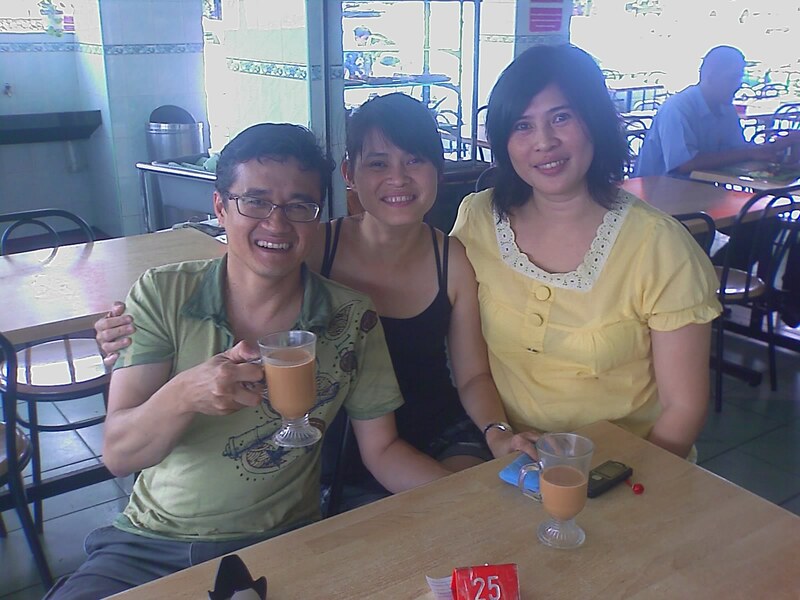 So, what I could remember about my grand parents came from the time I went back to Sibu during my school holidays. My grand father was one of the early settlers of Sibu that farmed the lands around the Rejang river back in the 1920s. Back in those days, the only mode of transport was via long motorised passenger boats that moved from jetty to jetty ferrying goods and people along the Rejang river to Sibu town. To me, my grandfather was a very disciplined no nonsense man, who believed that playing chess was almost equivalent to gambling... LOL. I really do not know much about the man. Part of the impression I got was based on observing my parents, uncles and aunties. 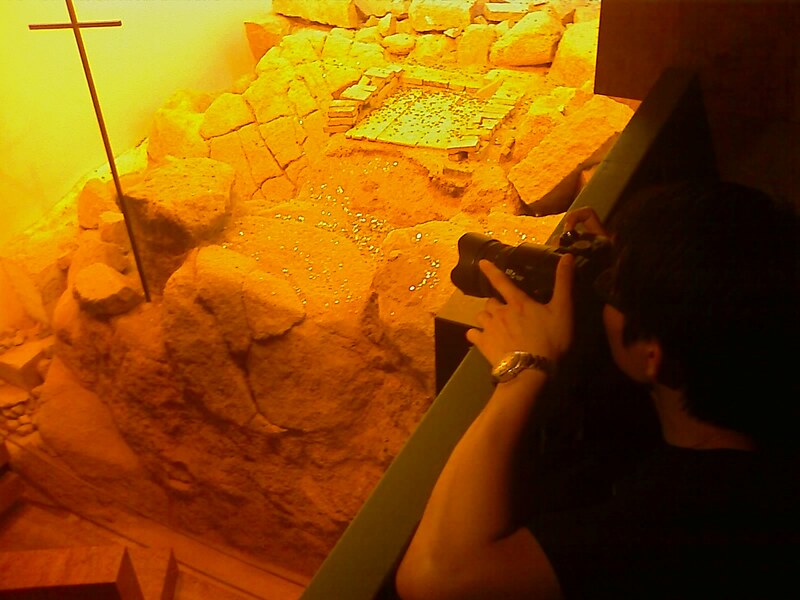 Their behaviors around my grand father made me thought that they feared the man. When my grand father walked into the room, everyone would hushed up. I do not know anything about my grand mother. She was bed-ridden due to a fall she sustained at the orchard's jetty. I only remembered that one time I helped my aunt to take her to the bathroom at the orchard house. I must have been 8 years old or less during that time. After my grand mother's incident, my grand father bought a shop property in Sibu town. And the orchard was given to one of my uncle to run. I did not go back to that orchard until I was 16 years old. 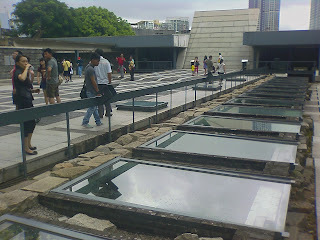 By then both my grand parents had passed away. One of the clearest memories of my grand father was that he always cooked for the family. In those days, every household had one of those giant wok (3 feet in diameter) encased in bricks. He would always cook porridge with sweet potatoes for breakfast. And for lunch or dinner, choy sum with ikan bilis and my all time favourite, steam salted fish marinated with sugar. When I was in Vancouver, Canada, together with my cousin, Paul, we tried to cook the salted fish marinated with sugar... LOL. It was something that both of us remembered about our grand father. 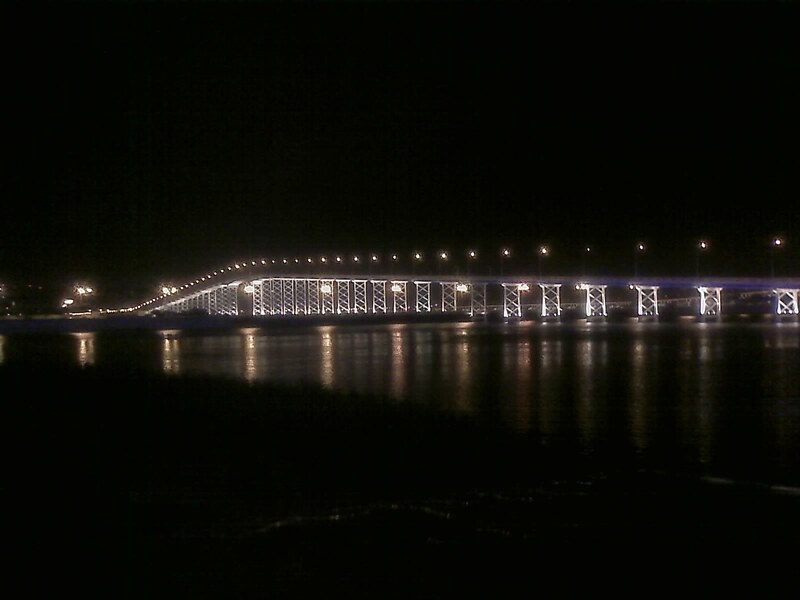 I wished I was old enough to ask grand father what it was like back in the days when he first settled in Sibu. I tried asking my father about it once, a long time ago and did not get much of an answer.... I remember vaguely it had something to do with only having "sweet potatoes" to eat. All I know is that, if not for what my grand father had labored for, we would not be us. In July, I had the opportunity to participate in a trade visit to Macao organised by the Asian-Oceanian Computing Industry Organization (ASOCIO). ASOCIO is "a group of IT industry associations coming from economies in the Asia and Oceania region. ASOCIO is established in 1984 with the objective is to promote, encourage and foster relationships and trade between its members, and to develop the computing industry in the region." The trade program was organised to coincide with Communic Macao 2010 & Digital Life Carnival which was held at Macau Fisherman's Wharf Exhibition Centre from 16th to 18th July 2010. 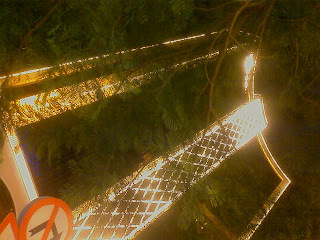 On the first night after our meetings, all delegates were invited to dine in a first-class restaurant (Bambu) in The Venetian. After dinner, we had the opportunity to explore the hotel and casino at leisure. 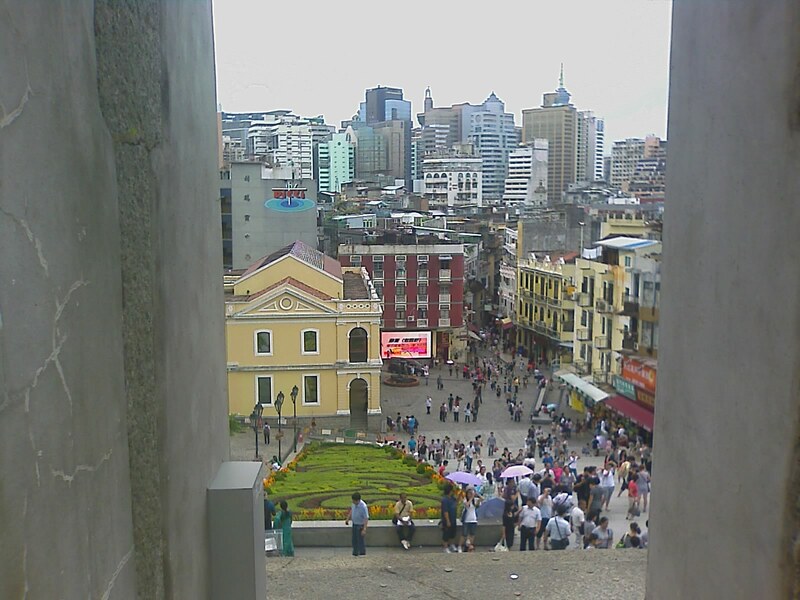 Our first destination was the famous Senado Square. We tried the yummy steamed milk pudding and the pork sandwich in Leitaria I Son dessert shop. 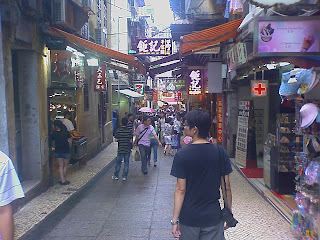 After that, we basically wandered all the interconnecting streets and alley ways. From what I could see, Tiensoon was in photography heaven. 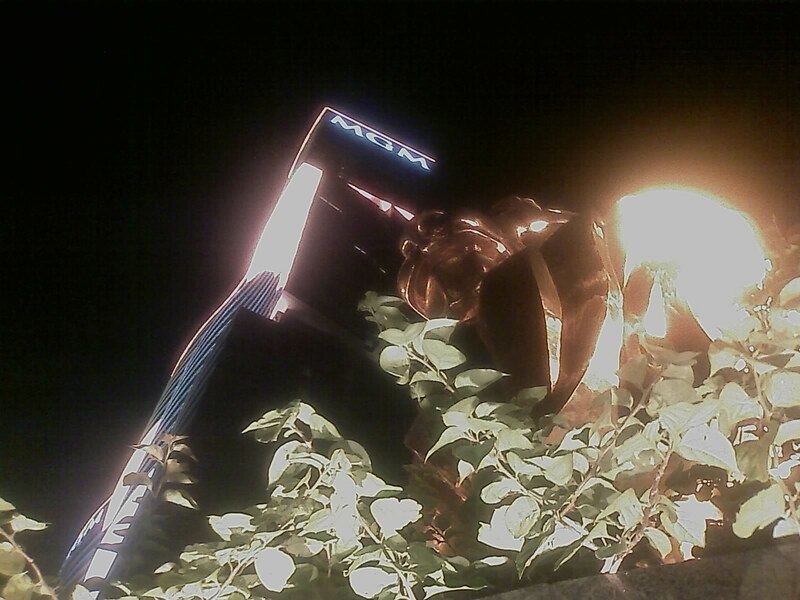 It was dusk and the street lighting had just came on... if you had a DSLR, it was a moment of graphic pleasure... LOL. 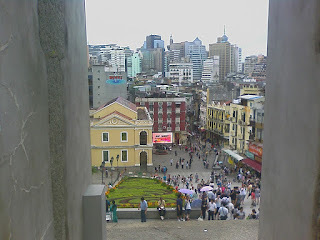 At about 11:30pm, after conquering Senado Square, we took the bus back to the hotel (I had a chore I needed to do... LOL). It was still very early and it did not feel right to be back at the hotel. And so at around midnight, we decided to head out again and walk the streets of Macao.... LOL. 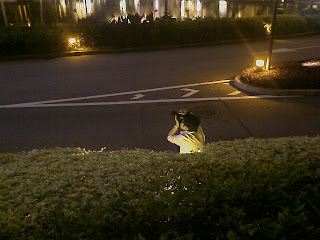 We started from out our hotel (Golden Dragon Hotel) and headed out into the night, Tiensoon with his DLSR and me with my trusty Dopod... LOL. 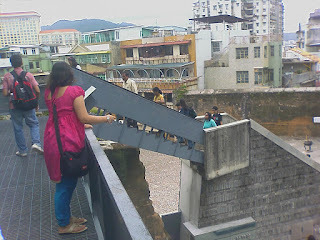 The following are some of the "visible" photos I took... LOL. 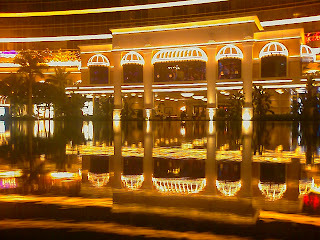 The Wynn Casino and Hotel. 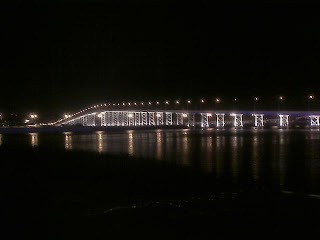 The Ponte Governador Nobre de Carvalho (Governador Nobre de Carvalho Bridge). Tiensoon looking for that perfect shot! 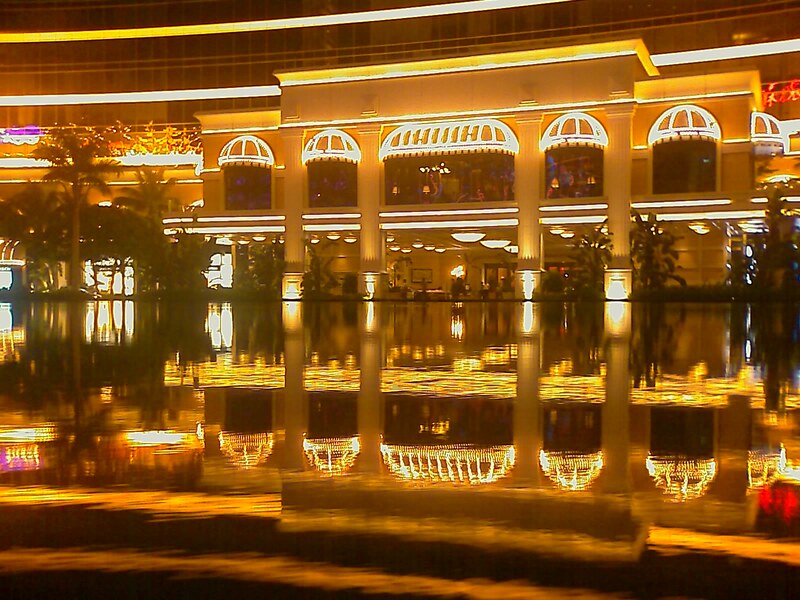 During the course of the morning, Tiensoon took some really remarkable photos of the casinos and their beautiful surroundings. You can check out his photo streams here... :-) We were done about about 4:00am in the morning. We ate some instant noodles and drank a couple of local beers at a 7-Eleven outlet before we walked all the way back to the hotel. It was a great and fantastic experience! 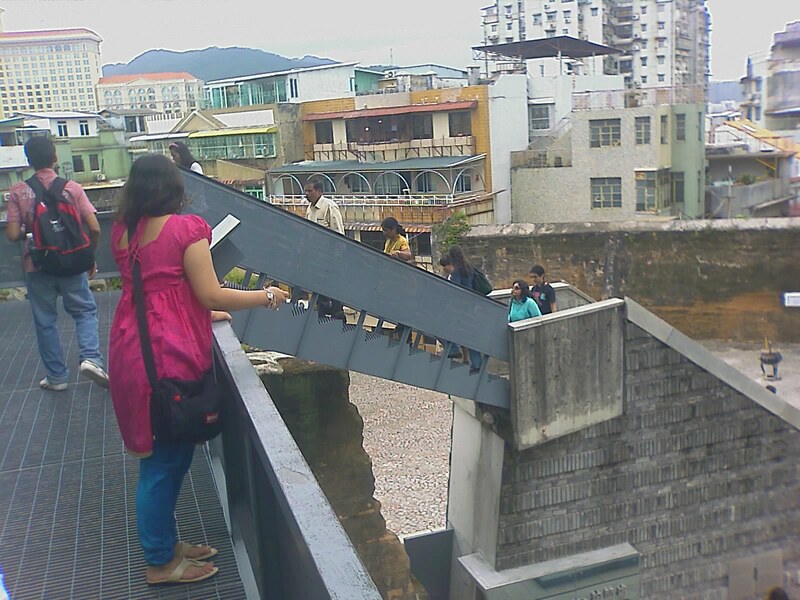 The third day, before my flight back to KL, we decided to visit the famous St. Paul's Ruins. 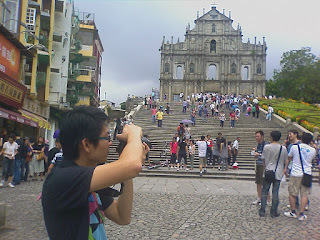 Again, we took a bus to Senado Square and made our way through a maze of narrow streets. The following photos basically documented our walk up to the church ruins and inside crypt. All in all, this trip to Macao was a very nice experience. 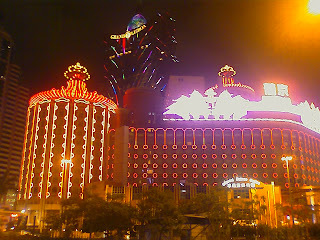 Generally, the night streets of Macao are VERY safe to walk in. 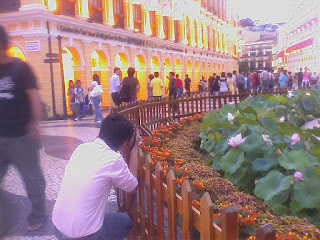 There are probably many more things to be done in Macao, like heading to the borders gateway to China... LOL. 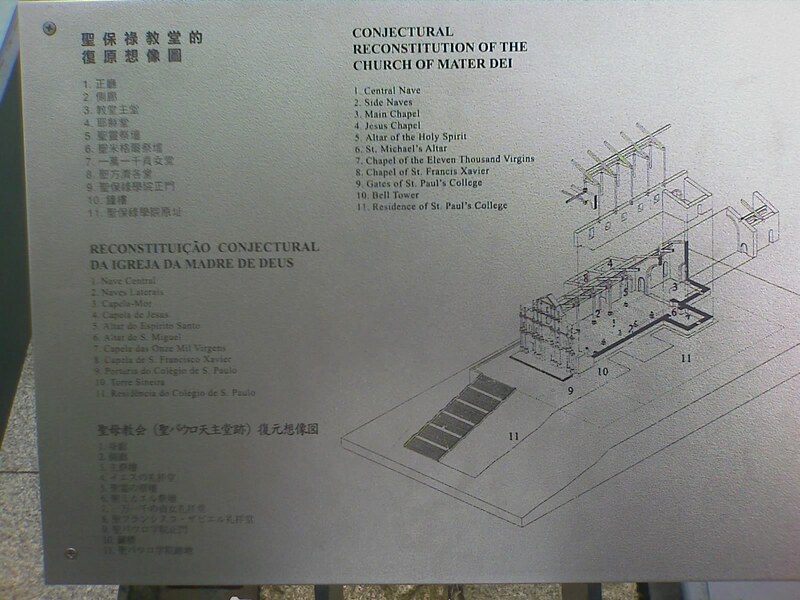 Maybe that will be reason enough for a return visit to Macao. 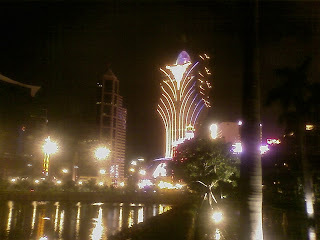 But will I make a return trip back to Macao in the very near future? Lets just say... maybe... LOL.